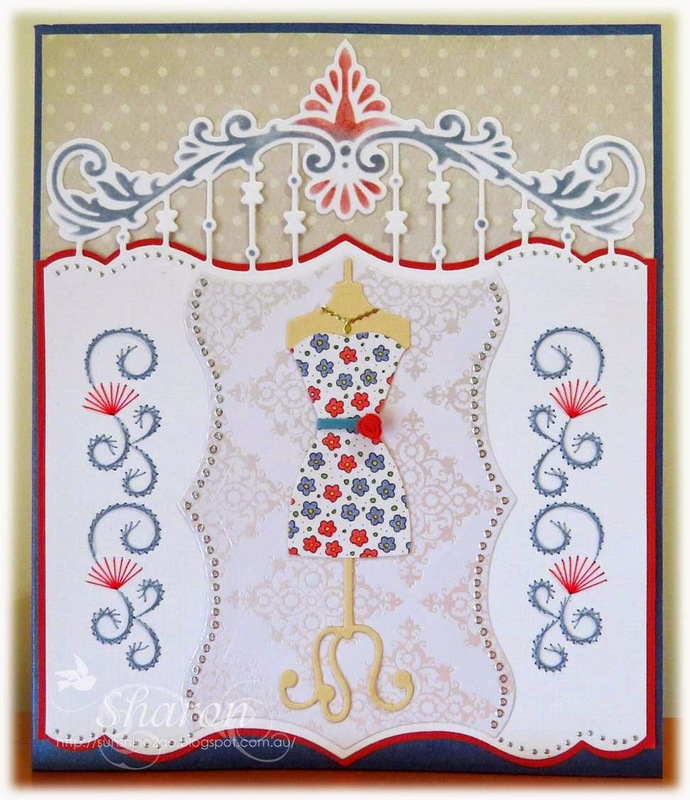 This is another wonderful pattern a298 by Ann's Paper Art I haven't used the complete pattern. Aged Mahogany and Weathered Wood. Once again I have used the new mannequin die by Marianne LR092 I added a belt, flower and a little necklace. I also cut out the background for the mannequin with the Marianne die and added hobbydots along the edge instead of the embossing. Patterned card is from my stash. I had lot's of fun creating this card and I hope that you also like it. This month my exchange card was for Ria. It is now Spring in The Netherlands and I thought that this card was perfect, now that the weather is improving hopefully they will have lots of sunshine. I used a stitching and cutting die which is designed by Ann AND002, and is available at Ann's Paper Art. The pattern was stitched with Mettler Polysheen 0442,0824,5934. I decided to cut some flowers with Nellie Snellen "Shape dies" SD004.and place them amongst the stitching. 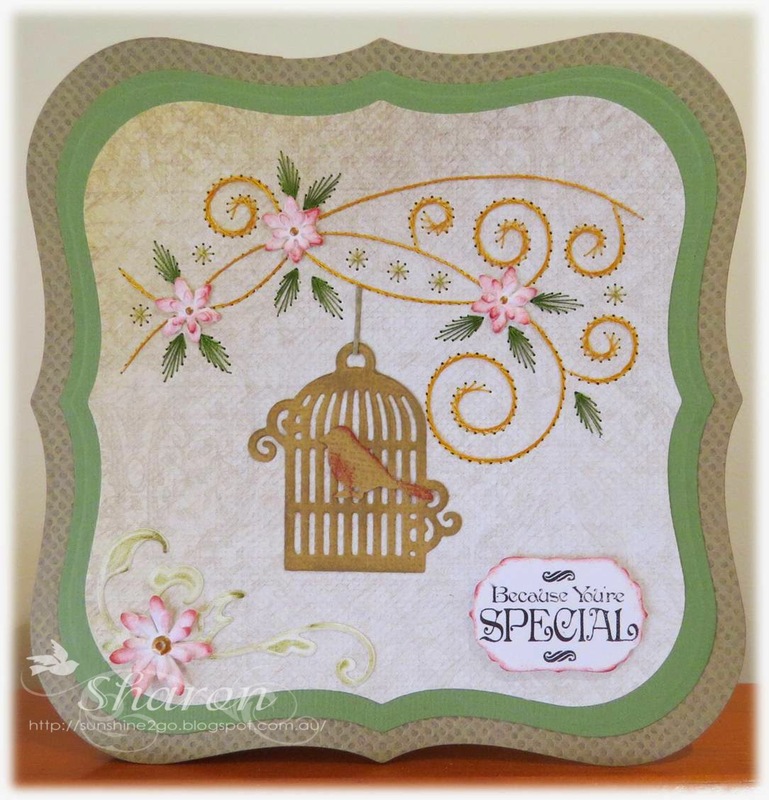 Birdcage and bird are by Joy "Vintage Flourishes" 6003/0034. The little corner flower is Joy 6002/0024 which has some swirls tucked behind by MD LRO250. "Because You're SPECIAL" stamp is from Lili of the Valley and fits perfectly on the Spellbinder S4-190. I have used Spellbinder Grand LF-161 to make the shape of the card. Distress Ink has been used on the dies to add some colour. Brushed Corduroy, Aged Mahogany, Forest Moss. I enjoyed creating this card and look forward to making a similar one soon. Today it is our son's 36th birthday and it is hard to know where all the years have gone. The pattern is once again by Ann Paper Art a431, I adapted the pattern and I love the end result. I also think that this pattern would make a wonderful square. I stitched the pattern with Mettler Polysheen 1514 and 3842. The cute image is from Lili of the Valley they have some wonderful coloured Art Pads and the one that I have used is called Jack, Patch and Puss. I distressed the edges and added some Frantáge "shabby white"
All the scallops were made with the Spellbinder Grand LF-127. I am looking forward to using this pattern once again. Thank-you for coming by a having a look. This is a very busy month for me when it comes to cards. 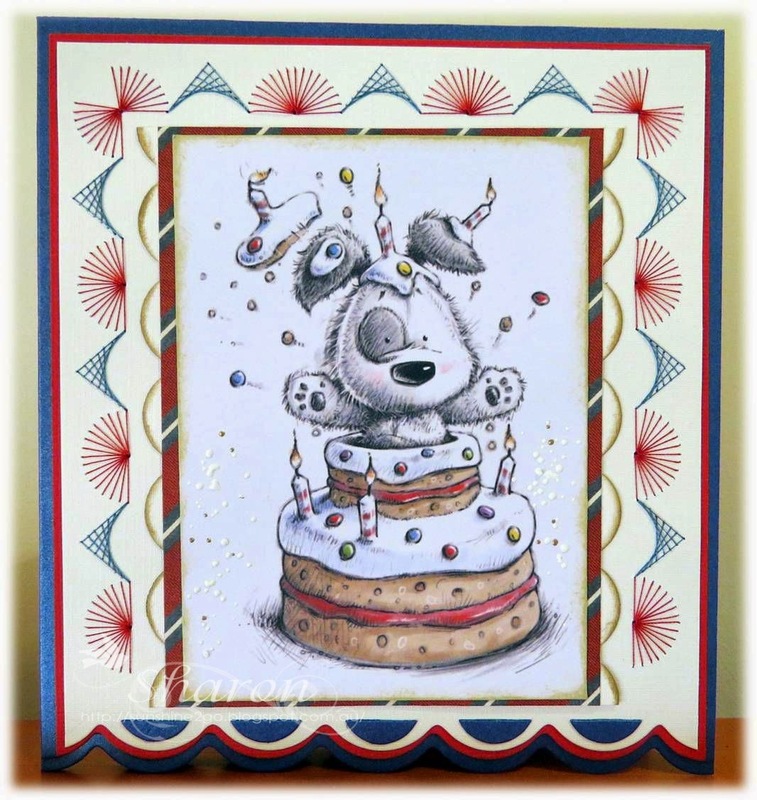 The first card for the month is for Annalie who lives in South Africa, I decided to make Annalie a easel card for her special day. Mettler Polysheen 0453, 2166, 3951,3030. I decided to make Annalie a bunch of Hydrangeas as I know that she has them in her garden. The beautiful die is by Joy! Crafts called Fantasy Flowers, 6002/0182. I really had a lot of fun making the flowers and highly recommend this die. The flowers were coloured with Tim Holtz distress inks, Dusty Concord, Tattered Rose and Weathered Wood, I used Forest Moss for the leaves. Joy! Crafts 6002/0260 makes a lovely boarder along the base card, I cut the die twice and added some Tattered Rose Distress ink along the edge. I added some of the little flowers from the Hydrangea die and added some leaves along the edge also. 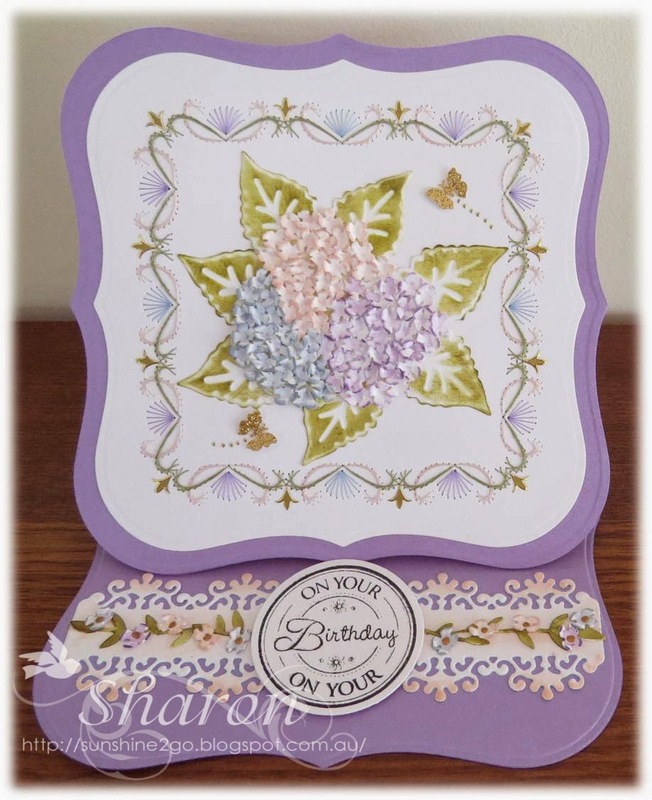 Liquid Pearls has been added to the little Hydrangea flowers on the base of the card. "On Your Birthday" sentiment is from Lili of the Valley I adore their sentiment stamps they are so very useful. Punched butterflies and stickers have also been added to the card. I created the easel card with Spellbinder LF-161. beautiful die many times as it is so very useful even the little flowers on there own are gorgeous. I hope that you enjoyed looking at my creation.